The 20th Annual AGITG Annual Scientific Meeting was held from 30 October-2 November. 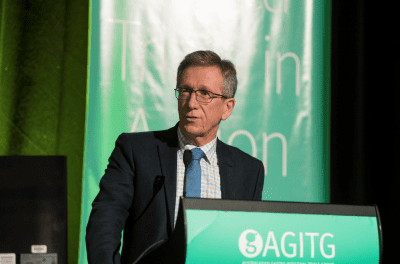 At the Annual Scientific Meeting Dinner, awards were presented by the AGITG to individuals and organisations for their dedication to research and groundbreaking new concepts. The Merck-AGITG Kristian Anderson Award to Dr Rosemary Habib, receiving one year’s funding for her PhD research project entitled “Chimeric Antigen Receptor T-cells Targeting Colon Cancer”. Best Poster to Dr Belinda Lee for “Pancreatic Cancer: An analysis of ‘Real-World’ stent-related morbidity in the palliative setting”. More information on the 2018 Annual Scientific Meeting is available here. Image: John Simes giving his acceptance speech after being presented with the 2018 AGITG John Zalcberg OAM Award.